My experience with getting a ZX Spectrum emulator to run on my iBook 600 led me to wonder how easy it would be to get a ZX81 emulator to run. 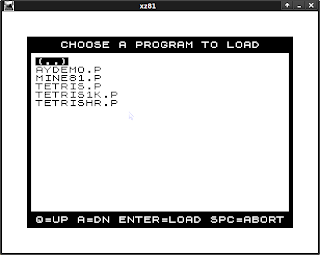 The tricky part was finding a suitable X11-based emulator. There wasn't an obvious port like FUSE or Xspectemu, but after a while I found one, the z81 emulator by Russell Marks. This emulator can be compiled for svgalib or plain X11, which is the version I chose. It's easy to compile, you just unpack it and type: make xz81 then sudo make install xz81 . You also need to download a ZX81 ROM - I used the Shoulders of Giants ROM. 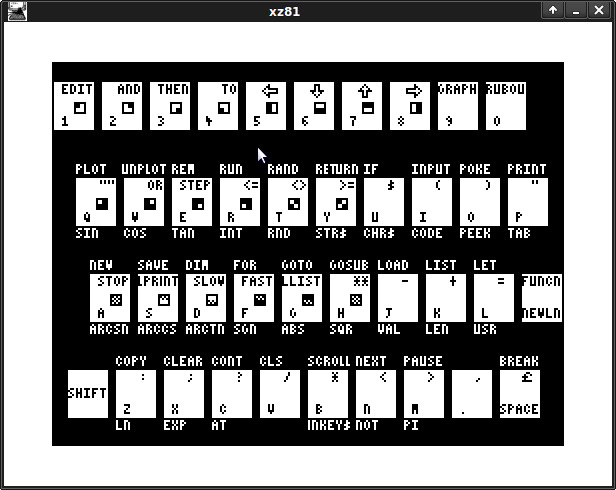 quirky mostly because the keyboard help screen is rendered as a ZX81 bitmapped image and the file-selector option is managed as a ZX81 program (though it's really written in C as part of the emulator). It doesn't support proper high-resolution ZX81 graphics, so some programs don't work so well. 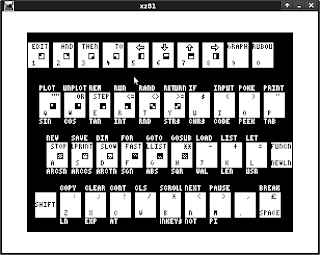 Since I'd had a comment from a previous user about a ZX81 Forth ROM I thought I'd try it, but the h4th.rom is quite hard to track down and in the process I found an alternative, a recently written (2011) ZX81 version of Forth called Toddy Forth. Although Toddy Forth in slow mode is merely 82% of the speed of the Jupiter Ace we must remember that in ZX81 slow mode, the computer spends about 75% of its time just generating a display: in fast mode the ZX81 should be about 3 or 4 times faster; easily beating the Jupiter Ace. Toddy Forth's download includes some extra definitions in a library. I added its plot command so that I could time plot operations. Here, Toddy Forth is significantly slower, though not outrageously so.